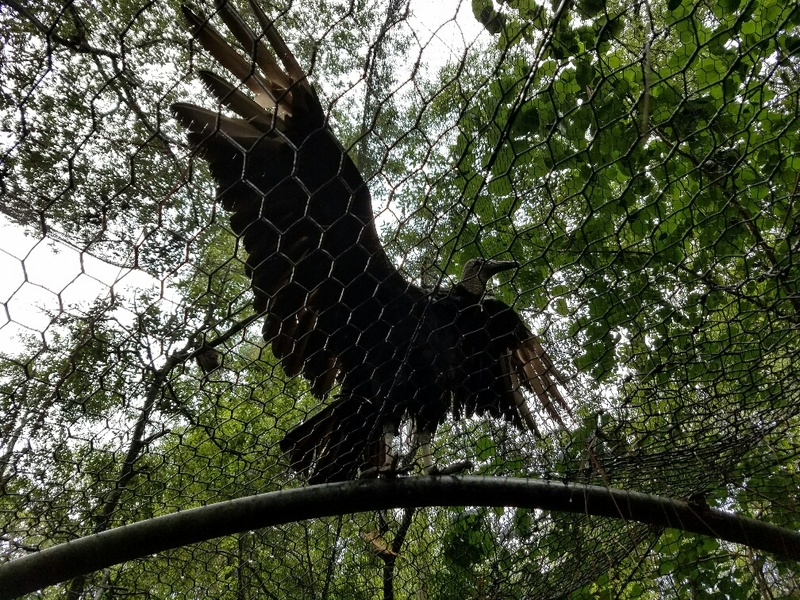 Ropes, rain, and raptors – Live MoHo! 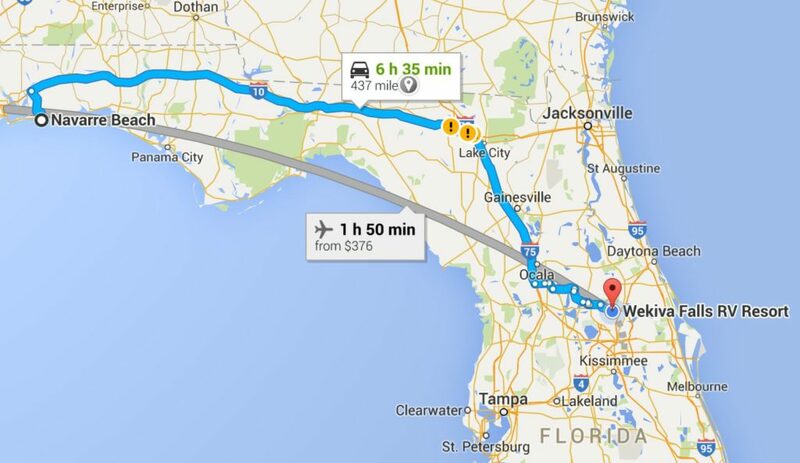 Florida is a very large state if one drives from the panhandle to the east and then turns south. Since we don’t like to drive more than about 4-5 hours a day, we needed a place to stop in the middle. 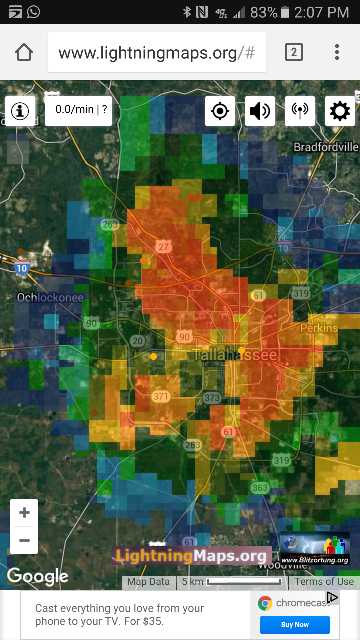 Tallahassee, the capital of Florida, is about halfway between Navarre Beach and Orlando. Google suggested two routes. Both were promising, and one was a lot faster than the other. Unfortunately, the faster option will require a C-130 Hercules cargo aircraft. Which we don’t have at the moment. So we decided to stick with the highways. We didn’t really intent to “tour” Tallahassee, not knowing what there was to see. Besides, our appointment at La Mesa to get our window leak fixed is just a few days away so we really didn’t have any extra time to linger. 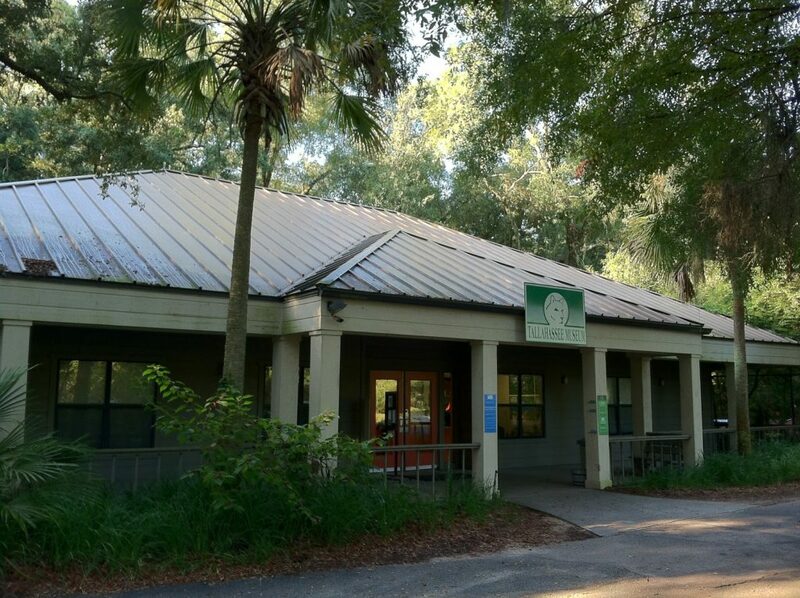 But, I booked 2 nights at the Tallahasee RV park so we would have at least a day to look around. Pro tip: we need to book 2 nights if we want 1 day to check out an area. I think I mentioned this already somewhere. Arriving at 3pm-5pm doesn’t give us time to do anything that night, and with a one-night stay we have to be on the road the following morning by 11am or 12pm at the latest. Since it takes an hour of preparation to actually leave, in practical terms we have to be starting the departure process by 10:00am. Not enough time to see much. 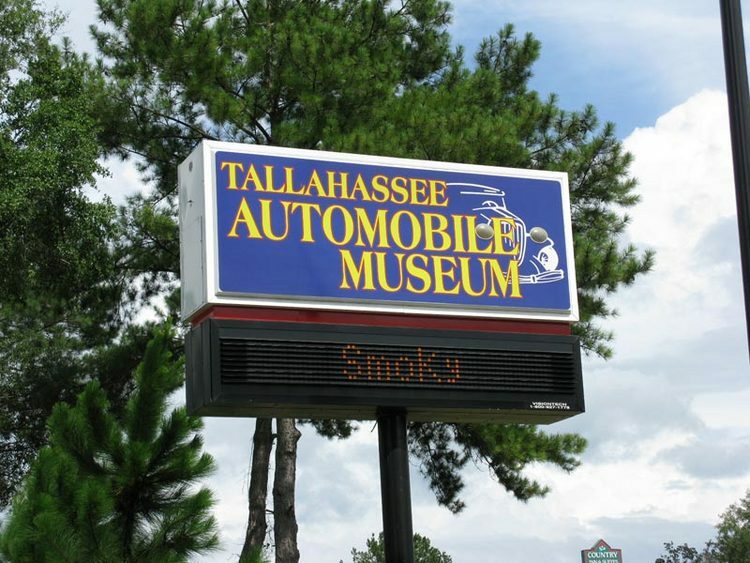 As we pulled off the highway to go to the RV campground we passed a sign for the Tallahassee Antique Auto Museum. It was literally right next to the RV park. You know we love a good auto museum! So we knew we wanted to go there on Sunday. 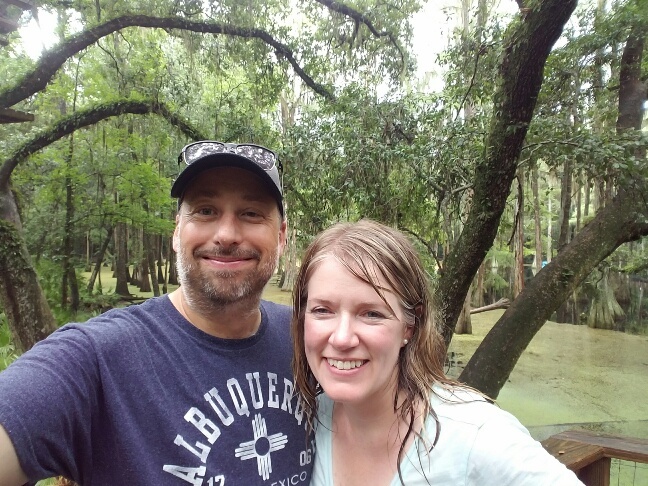 Thanks to a tip from a friend (shout out to Terrie Gray), we had been told to visit the Tallahassee museum. So Sunday we have two “I wanna see that” options.. We decided we could do both if we hustled. Tallahassee museum would be first, by reasoning that if something happened, we could actually see the auto museum on Monday. It opened at 8:00am and since it was right next door we could actually see it the next day if we had to. We could not do the reverse. Off we went to the Tallahassee museum. 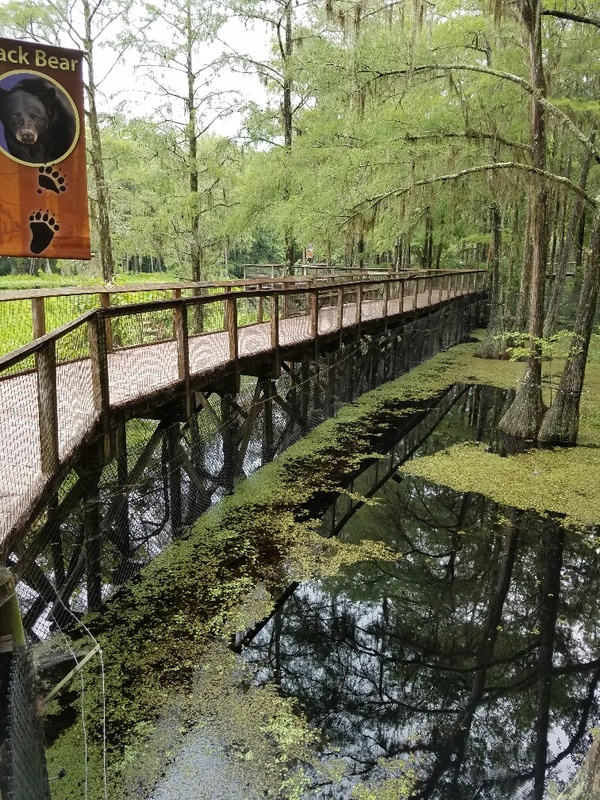 It is an interesting mix of outdoor exhibits, with a plantation house, a mid 1800s Florida farm, animal enclosures, and a treetop ropes course with zip lines. 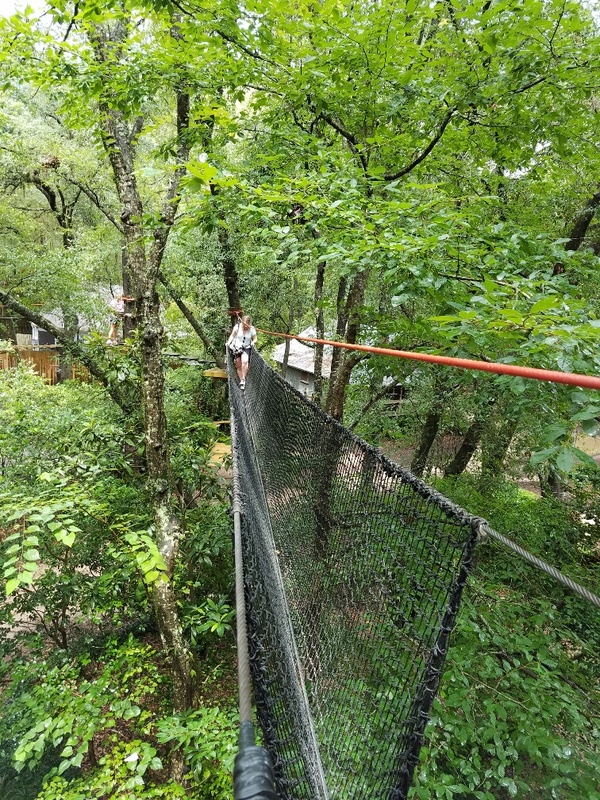 We arrived around noon, and decided we would try the intermediate ropes course as part of our visit. 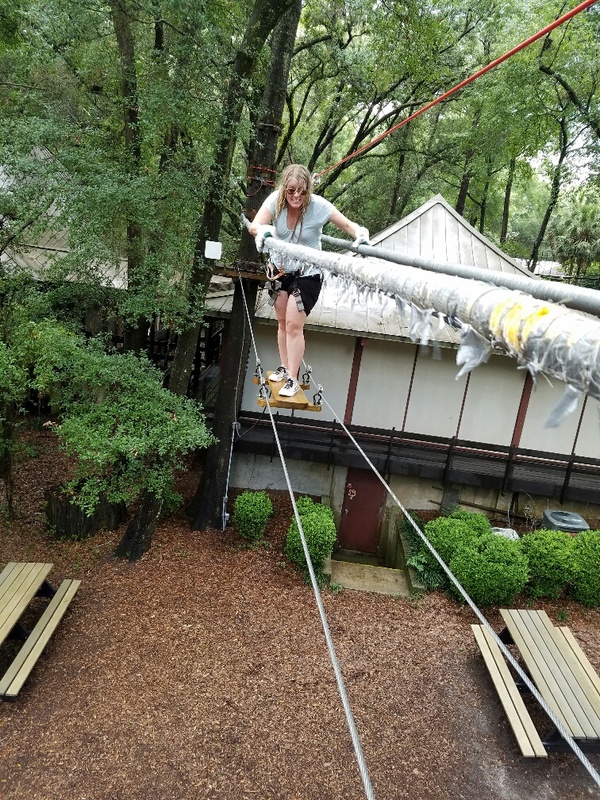 Heather suggested we immediately do the ropes rather than wait until later in the afternoon because of the rainstorms that regularly roll through Tallahassee – and really all of the panhandle- every afternoon. Sure enough, clouds were already forming around us and we could hear thunder in the distance. After that near-miss in Navarre Beach, we are more attuned to lightning than we were before living MoHo. We put on our climbing harnesses and completed about half of the initial training course with thunder getting closer and closer. 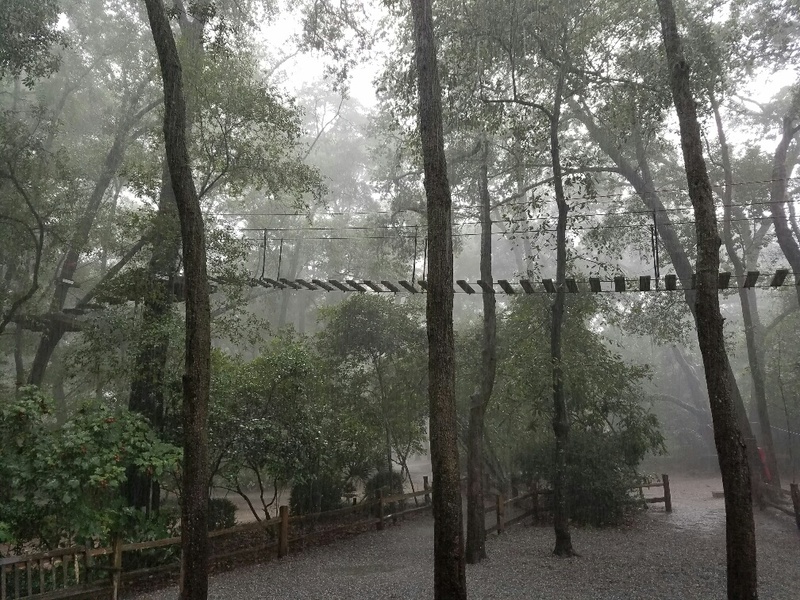 The rule is that no one is allowed on the ropes course if lightning is within 10 miles anytime in the past 20 minutes. Just as we were about to finish the training and climb up into the treetops, the weather monitor cleared the course and stopped the ropes. Lightning had struck inside the 10 mile radius. By the way, they used a site called Lightning maps (http://www.lightningmaps.org/). I had not heard of this site before, but I sure will be looking at it now! We decided to hope the storm would pass quickly and our delay would be short. As we waited, we decided to walk around the grounds – still in our climbing harnesses with all the carabiners. One of the first exhibits we saw was a caboose. I had to go check it out. My granddad (Mac) was a railroader, working for the Candian Pacific railroad and then later the Union Pacific railroad. In fact, it was the job with the Union Pacific that brought him and his family, which included my Dad, Aunt, and Uncle from Canada down to the States. One summer, my granddad took my brother and I on a train ride between Cody and Greybull, Wyoming. Or between Greybull and Sheridan, Wyoming. I don’t remember anything other than the Greybull part. For some reason, naming a town after a grey bull really stuck with me. Anyway, I remember the trip itself much better than the map details. My brother and I got to blow the train horn and “drive” the train! After a stop we ended up in the Caboose for much of the rest of the trip. 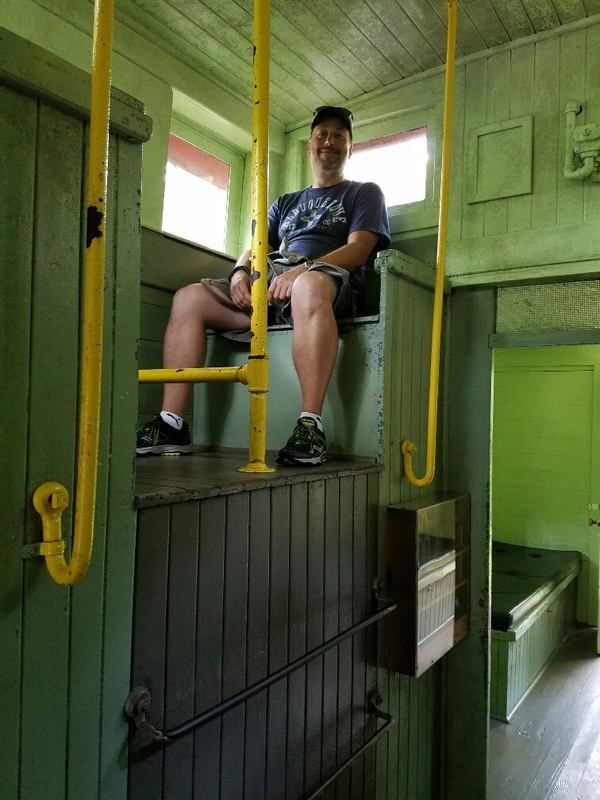 I remember climbing up a tall ladder from the main floor to a little seat in the high middle part of the Caboose and looking out a window. 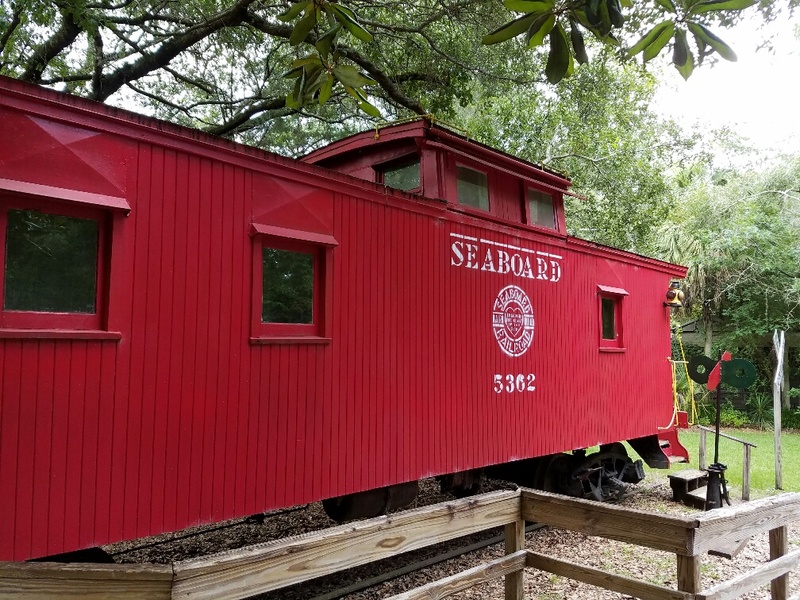 Would this caboose have that seat? It did. The climb up to the seat wasn’t quite so towering as I remember. The seat wasn’t as high up either. But for a minute I was back in that caboose with my granddad travelling across the prairie, listening to the clack-clack, clack-clack, clack-clack of the wheels on the tracks and feeling the car rocking from side-to-side. My brother and I looked up at our granddad like a hero that day and both of us dreamed of life on the rails. That was a good day. From the caboose we walked to the plantation area. I didn’t know before, but this part of Florida was the most productive cotton area in the entire south. At least, that’s what they claimed. 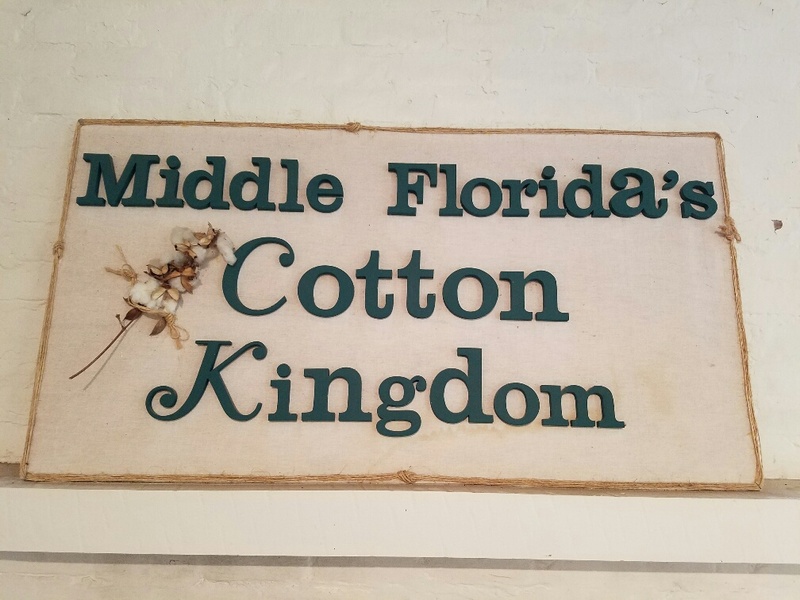 It was called the Cotton Kingdom and was more-or-less dedicated to cotton plantations. Plantation houses in this part of Florida are not the grand antebellum mansions I pictured from the movies. Instead, the plantation owners spent their money on the means of production and not on their houses. 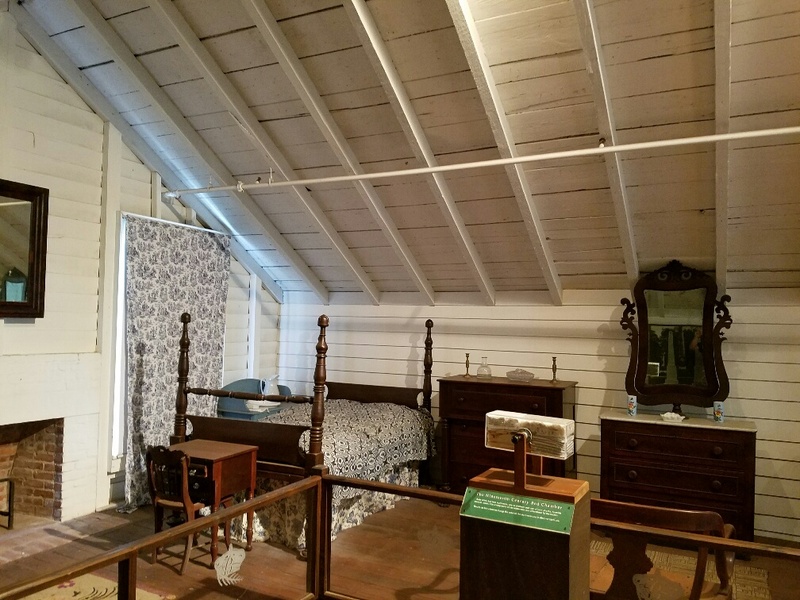 The second floor was essentially what most of us would consider the attic. 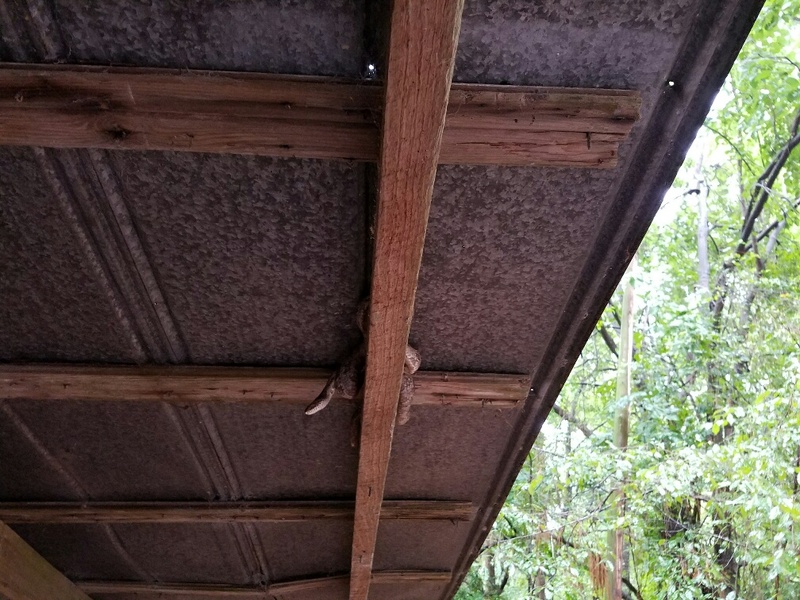 I guess in this part of Florida insulation is unnecessary because the underside of the roof was just as bare as the walls. This particular house had an interesting story. It belonged to Catherine and Achille Murat. Catherine was known as “Princess Catherine” and was in fact a real French princess. She was the cousin of the man who became Napolean III, and was officially recognized by his court as a bona-fide princess. She married Achille Murat whose great-grandmother was George Washington’s sister. She returned from France to her property in Florida, where she was renowned for hosting lavish parties. Later, she died in a very 1800s way – of typhoid fever. Anti-vaxxers, note that. Thunder seemed to be letting up, and so was the rain, so we walked back to the start of the ropes course. About the time we made it back, the bottom fell out of the sky and the rain came down in sheets. Actually, the downpour started about a minute before we made it back to the shack at the start of the ropes course. We got soaked. I mean really soaked. Fortunately, nothing water-damageable was in our pockets. Including my phone. About a month ago I got the Galaxy S7 Active, the rough-and-tumble rugged phone that is not only water resistant, its MILSpec certified against drops, heat, cold, vibration, shock, etc. It is tougher than I am. 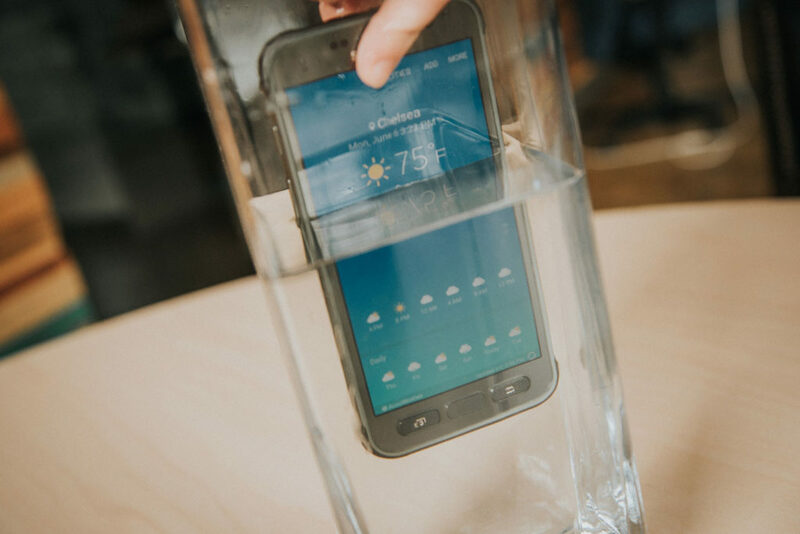 Since the phone is designed to be used in the wet, Samsung has even put in a moisture detector to keep unsuspecting owners from putting the charging cable into a wet charge port. Cool! 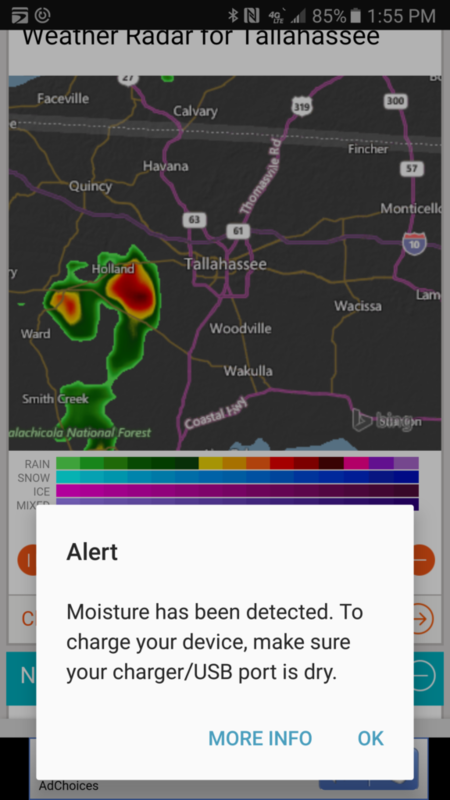 Sure enough, after a few minutes of that rain my sopping rain-wet phone told me that I shouldn’t try to charge it until it was dry. Well, not charge with the cable. It would work with the wireless charging pad. If you haven’t tried wireless charging by the way, you are missing out. It is cool! After 30 minutes or so, the downpour started to let up. Unfortunately, the lightning didn’t. Since it had to be 20 minutes after the last strike within 10 miles, the 20-minute clock kept resetting itself. All it took was one strike somewhere and the clock reset! Grrrrrr…. Rather than just stand at the little hut for the ropes course looking at my wet phone, we decided to walk over to the model farm complex. First up was the company store. The display was very well done. 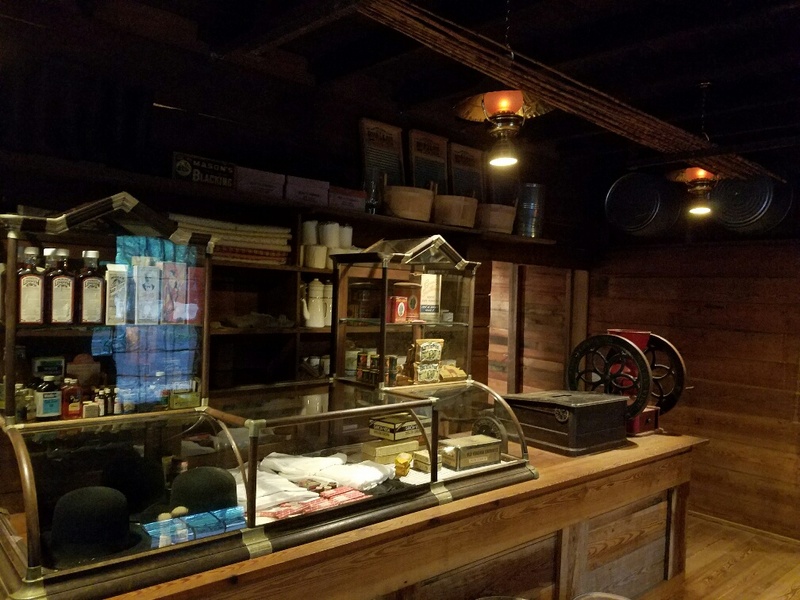 This was the proverbial “I owe my soul to the company store.” Signs explained how the remoteness of the plantations/farms was such that the company store was the only place workers could buy supplies. Consequently, owners marked up prices 10x to 1000x what they would cost in the major cities. Workers quickly found themselves in debt to the company store. Even worse, before protective labor laws, workers who fled before the debts were paid could be arrested and made to return to “work off the debt.” Sadly, many workers, including the recently freed slaves, found themselves little better off and little more free than they were before. Fortunately, labor laws were enacted preventing that kind of abuse in later years. The rain had started again, so we stood under the roof on the porch waiting for a break. I looked up and saw that we were not the only ones seeking shelter. Wait, is that a SNAKE? 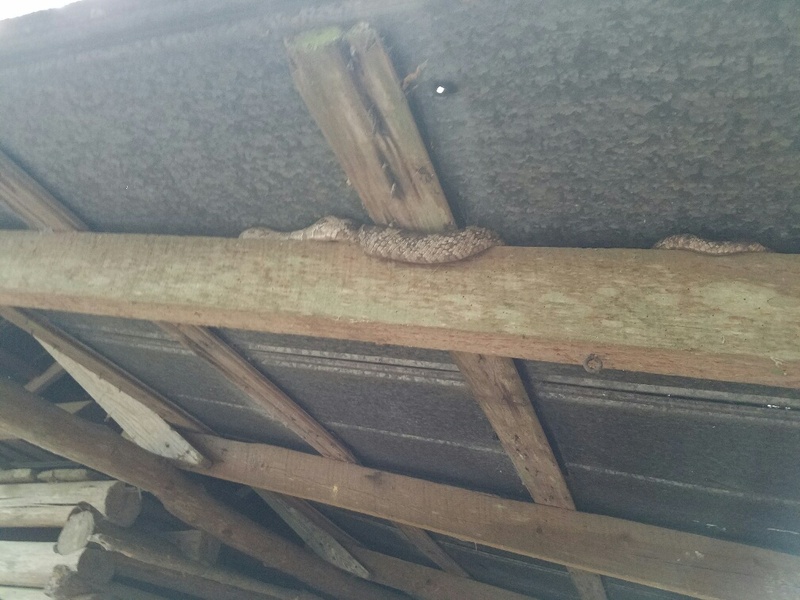 A large snake had taken up residence under the tin roof and was hanging out with us. Gaaaaaahhhhhh. What is it with Florida wildlife lurking overhead??? I’m not as squeamish about snakes as I am about those freaky huge spiders. Heather on the other hand was equally dis-pleased with both. Even so, I sure didn’t want to be standing under this guy. Especially since I didn’t know what he was. Turns out he is a Florida Ratsnake. Non-poisonous and reportedly fairly docile. I didn’t want to put my hand up there to see if that claim was true. Not begrudging someone just trying to keep dry, we left him be and walked on. 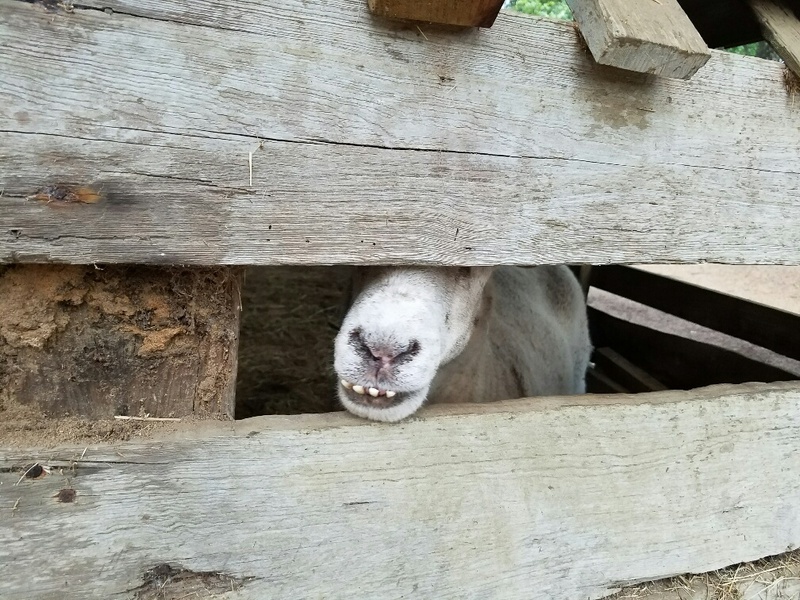 We saw a sheep watching the rain through the slats in his pen. He was free to walk into the pasture, but wisely chose to stay indoors. 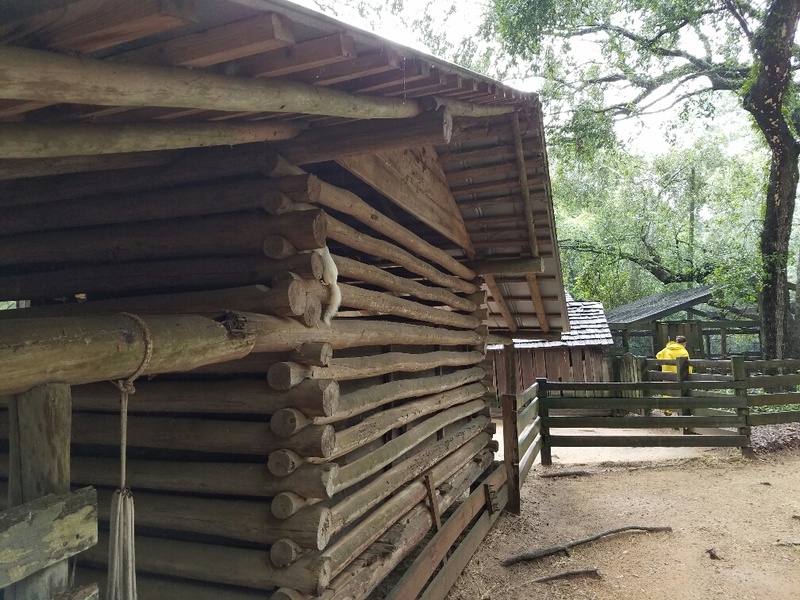 On the other side of the enclosure, we saw a white squirrel. At first, I thought it was an albino, but its eyes were brown. Not a true albino. Then I saw another one. Then another. It turns out they are all descended from a pair that came here in the 1960s. I was surprised the squirrels were not picked off by predators, standing out the way they do. But, here they are, and apparently flourishing. 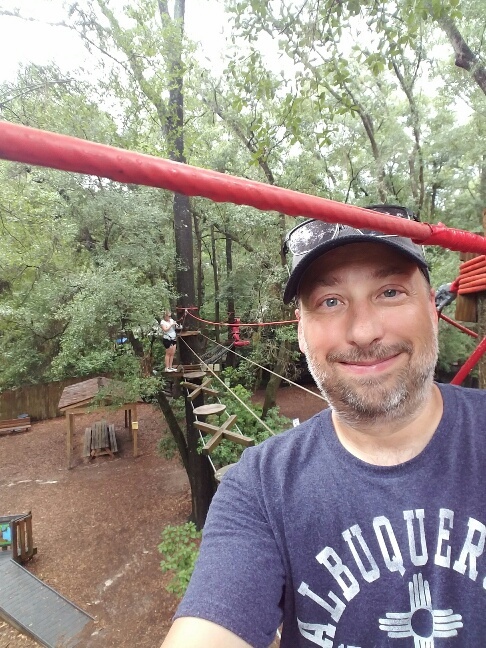 After a couple hours of false starts, the storm moved on and we were allowed to climb up to the treetop rope course. The course had over 20 stations and covered a large part of the museum grounds. We were just on the small course! I was impressed that the training was very thorough and they taught good technique. I suppose they have no choice because the course is self-paced and there are no employees up there with the guests. We were on our own the entire time! Some of the stations were pretty thrilling like this single wire tightrope section. One of the most fun stations was the sky skateboard. We planted our feet on the board and then surfed from one tree to another. Each station was different and each one was super fun! We both had a great time. The course took almost 45 minutes to complete and we were not wasting time or lollygagging. I highly recommend it. As we climbed down the final tower, word came that the course was closed once again. Talk about cutting it close! I was glad we waited around to finish, even though it meant we would not see the auto museum today. We had time on Monday morning. 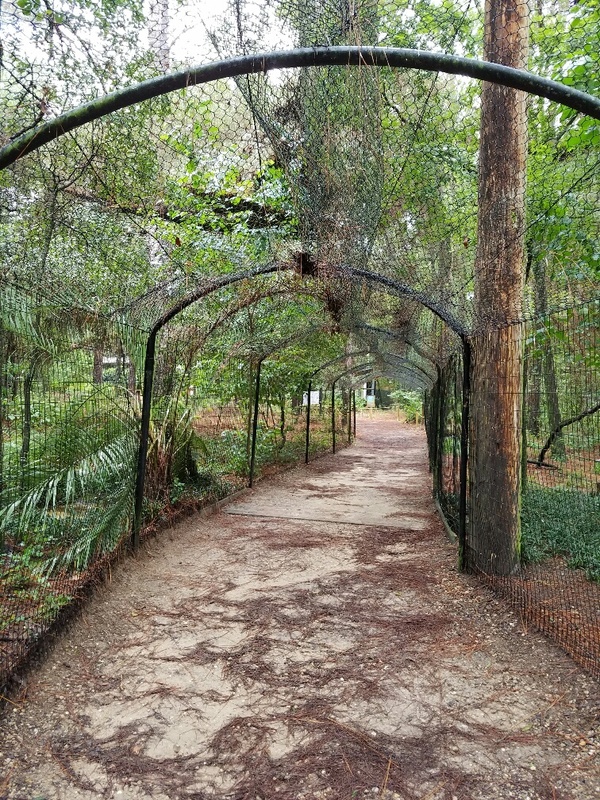 The entrance is a sort of tunnel made out of nets that goes right under the raptor aviary. Right above us was a huge buzzard drying its wings. Yes, more Florida wildlife over our heads. No this one wasn’t as creepy as the others. The trail went past some gen-u-wine Florida swap. It was beautiful and so different than anything we saw in California. 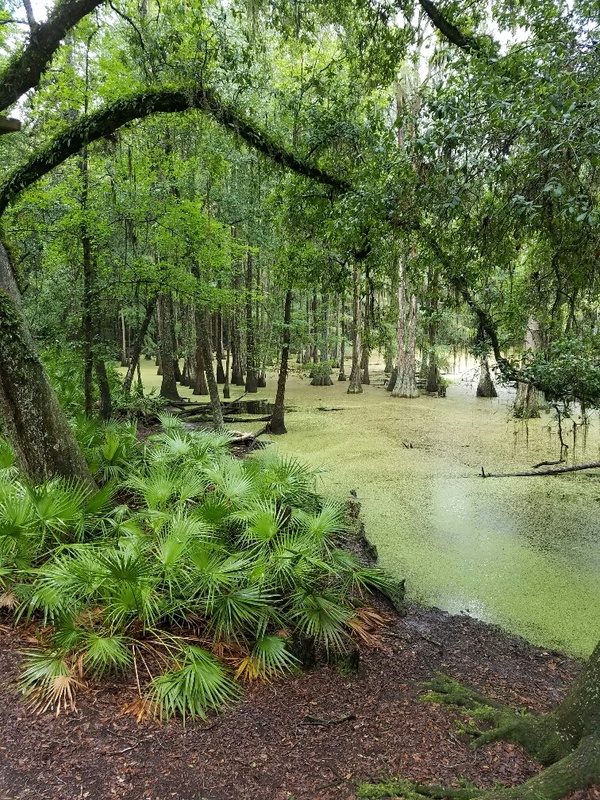 The trail through the swamp was elevated, presumably because of alligators. We wanted to see one, but I guess they were all at Disney World or something because we never did see one. 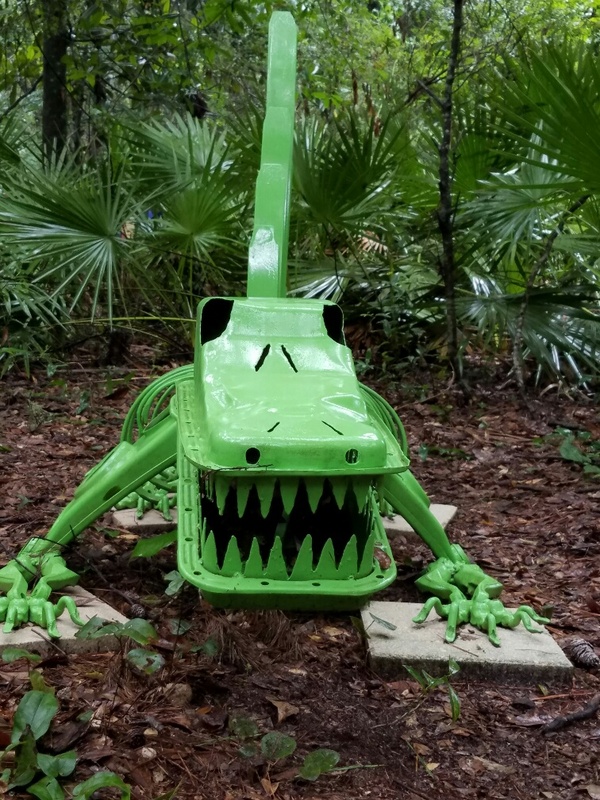 Instead of alligators, we saw the dinosaur sculpture garden. 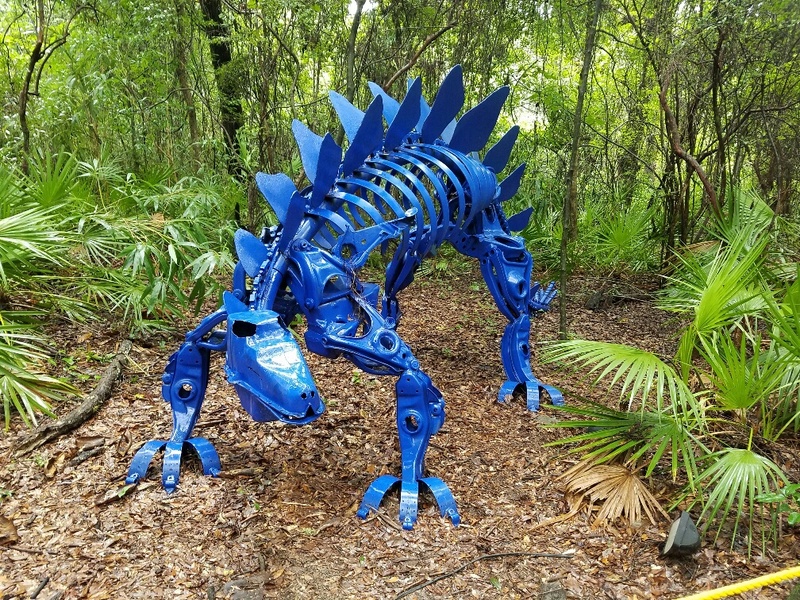 They were made out of car parts. This little guy has two oil pans for a head. There were quite a few different car-o-saurus lurking in the foliage. I think one of the most creative was this guy whose shell was the roof and back of a VW Beetle. 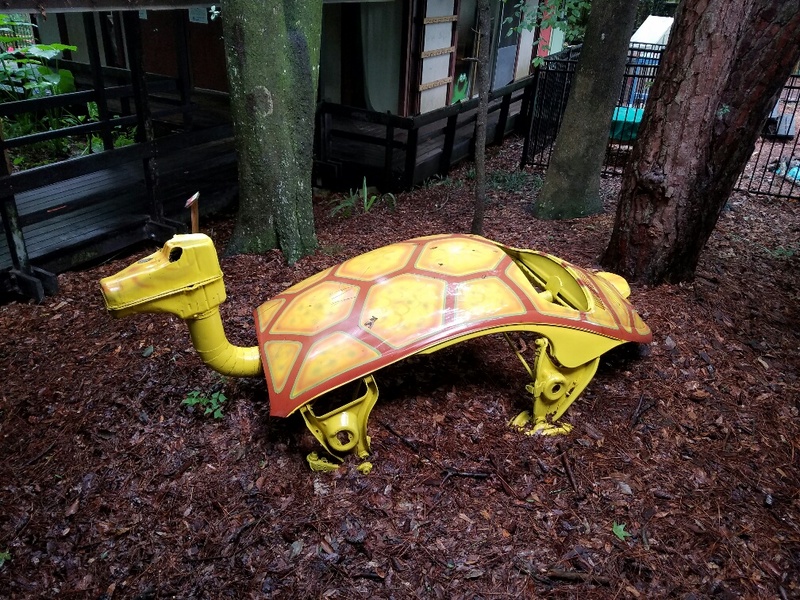 Our time at the Tallahassee Museum was over. We were drenched, tired, and very happy with our day! This sounds like a great day! I’m loving hearing about all of your adventures. Thank you for taking us all with you. So glad you had fun there, in spite of the rain. I’ve never done all the things you two did, but (unsurprisingly) spent all my time in the wildlife area. Maybe with the rain the foxes, bobcat, and mountain lions would have been even more unlikely to be seen than usual.